Snowpack Summary for Friday, January 18, 2019 7:52 PM Wettest week this winter brings increased and prolonged avalanche danger. Overall: The Kachina Peaks Avalanche Center would like to express sincere condolences to our neighbors in Taos, regarding the recent avalanche accident. This week's precipitation provided 40 inches (102 cm) of new snow at 10,800 feet and over 3.5" of snow water equivalent (SWE) at Snowslide SNOTEL station. This significant snow event has increased stress on an already fragile snowpack. 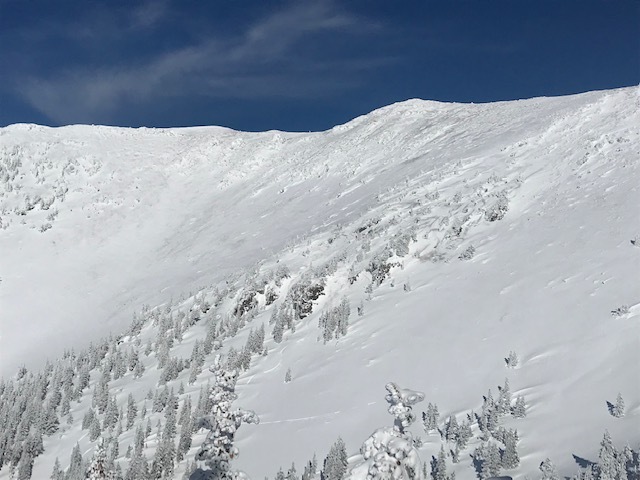 Widespread whumpfing and cracking on northwest slopes near Alison Clay Bowl were observed today (Jan. 18, 2019). Stability test results indicate an unstable and reactive snowpack. Strong west to southwest winds have transported snow onto leeward east and northeast aspects, increasing avalanche hazard along the Agassiz Peak ridgeline above the Snowbowl into the Inner Basin. Natural avalanches are possible and human triggered avalanches are likely. The specific problems will be wind slabs, persistent slabs and storm slabs. The snowpack contains weak faceted layers with denser snow above. Unstable conditions have been observed on a range of aspects and elevations. Faceted layers are reactive, showing a tendency to propagate and collapse in response to a skier's or snowboarder's weight, both strong signs of dangerous instability. Rapid warming, forecast for this weekend, may increase the sensitivity of slabs, thus more susceptible to failure. Warming of slabs will be on sun-affected slopes above treeline, i.e. south, southwest and western aspects. Column tests near Alison Clay Bowl on a 30° NW slope at 10, 900' had the following results: CTV (Sudden Planar) and PST 7/100 END. The failures occurred approximately 40cm from the ground, in weak faceted snow. Even at treeline, the temperature is expected to reach 40° F on Sunday January 20th. Temperature increases on formerly cold aspects can promote reactivity and avalanche activity. Near and Above Treeline:Localized wind slabs are sensitive to failure under the weight of a skier/boarder. Increased fracture propagation and energy has been observed in stability testing below and near treeline, indicating an increasing trend in the probability that added snow load will significantly raise the avalanche hazard. Additional precipitation warrants further assessment of wind loading patterns, in regard to aspect and elevation. Near and above treeline slopes, chutes and gully walls are much more susceptible to wind slab formation than below treeline. Remember most slab avalanches occur during a storm or within 48 hours of accumulation. However, rapid warming this weekend may increase the sensitivity of slabs to skiers' and boarders' impact. Below Treeline:Cracking and whumpfing continues to be observed below treeline, an indicator of a reactive weak layer within the snowpack. The near surface facets from the cold spell in late December are collapsing under the weight of the new snow and skier traffic. Carefully assess run out zones and terrain traps. Snowy weather this last week has helped the lower elevation snow coverage. The storm on Monday night and Tuesday, January 14th and 15th delivered 9" - 11" of high density snow to lower elevation above 8,000'. Currently 25-35" of snow cover can be found between 9,000- 10,000' and more above. Strong west and southwest winds have loaded the Agassiz ridgeline during the last week. Also, high density snow is less apt to be transported, wind speeds of sufficient force to transport snow have been recorded at high elevation. Winds out of the south and southwest shifting to westerly and northwesterly have been observed in association with the most recent storm. Watch for wind loaded slabs, particularly on northeast, north, east and southeast facing slopes near and above treeline. Keep an eye on the ASBTP weather station. Readings between 15 and 35 mph indicate the potential for snow transport and formation of wind slabs. Look for various links under the weather menu above. Weak faceted snow-layers under old wind/storm slabs exist at elevations above 10,000'. Stability tests have revealed this problem on northerly, northeasterly and northwesterly aspects. The snowpack is exhibiting increased energy and propagation during recent stability tests. Carefully evaluate slopes on all aspects and elevations. Column test in Beard Canyon on January 11th indicating persistent slabs. Storm Slabs form when new snow consolidates over a weaker layer or interface. The weak point can be snow that fell early in the storm or just a poor bond with the old snow surface. Storm slabs commonly form during periods of light or no wind. They can be very sensitive to failure, but the problem is usually short-lived, soon bonding to the snowpack below. The bullseye slope angle for avalanche activity is 38 degrees. Moderating slope angles to 30 degrees and less drastically reduces the likelihood of triggering an avalanche. Storm slabs tend to stabilize relatively quickly. Waiting for a couple of days after significant storms is always prudent. Storm slabs gain strength and bond with the old snow below, resolving much of the problem. Widespread cracking and whumpfing today (January 18, 2019) on 30° NW slopes near Alison Clay slide path. 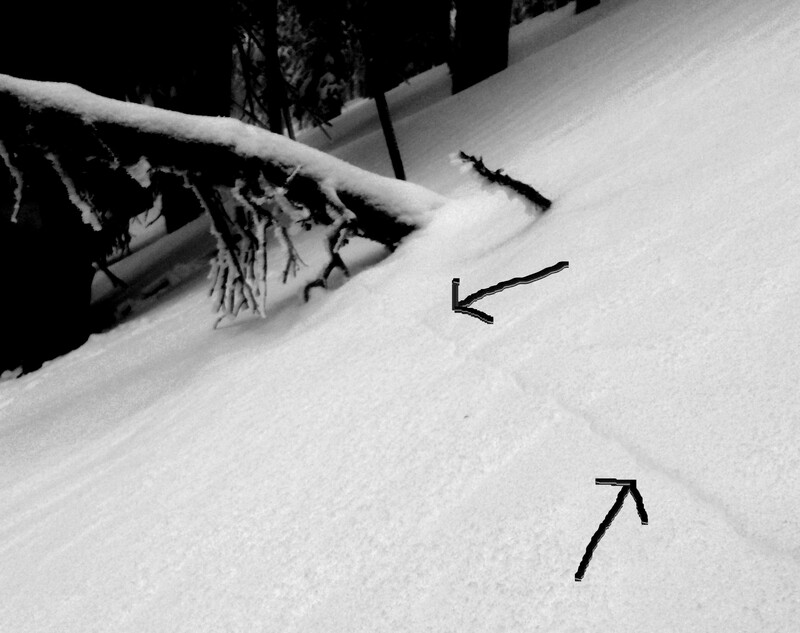 Arrows drawn on image show cracks that where shooting 50+ feet from under our skis. Explosives deployed at Arizona Snowbowl resulted in localized slab releases with 6-8 inch crown fractures. Reminder: Outside of the ski area, there is no avalanche control work. See our courses page to register for a class and get avy savvy. Backcountry permits are required for travel in the Kachina Peaks Wilderness and available at local USFS locations, as well as, at the Agassiz Lodge on Saturday and Sunday 8:30 -11:30 a.m. Permits are currently not being issued due to the partial government shutdown. The past week was by far the wettest this winter. A storm that hit last Saturday night, January 12th, dropped 6-7 inches of new snow at 10,800 feet with greater depths observed at higher elevation. On Monday night and Tuesday January 14th and 15th a major warm storm impacted the region bring 2 to 2.5 inches of snow water equivalent (SWE) and 11 to 34 inches of moist high density snow to elevations above 7,500 feet. The rally continued on Thursday night and Friday morning with another round of precipitation adding 6-7 inches of snow at 10,800 feet. During the week, moderate winds out of the south and southwest have accompanied the precipitation. Stronger winds, within threshold snow transporting velocities, characterized Thursday evening’s storm. On Friday January 18th winds are forcasted to shift to westerly. blowing between 22-32 mph, gradually diminishing later in the day. Clearing to partly cloudy skies and warming and drying conditions will prevail during the weekend and into next week. Winds will pick up on Sunday night and continue on Martin Luther King Day, Monday January 21st. These winds may redistribute some snow that fell during the past week. On Friday morning, January 18th, the Inner Basin SNOTEL site (Snowslide) reported a snow depth of 36 inches (91 cm) with about 0.5 inches of new SWE in the last 12 hours at 9,730 feet. Arizona Snowbowl reported a settled base of 52 inches (132 cm) at 10,800 feet, 6 inches of which have fallen in the last 24 hours. So far this winter, 120 inches (305 cm) of snow have fallen at the mid-mountain study site. Since January 11th, SNOTEL temperatures have ranged between 7°F on January 12th, and 38°F on January 17th. For the same period, the AZ Snowbowl Top Patol Station (ASBTP 11,555 feet) temperatures ranged between 12°F on January 14th, and 30.5°F on January 12th.